I don’t shoot often enough in Bozeman, but one gorgeous place in the area is up Hyalite Canyon. Sadly I haven’t been up there in summer, but the several times I’ve done shoots in winter it’s been amazing. The mountains up there are so pretty and I love seeing everyone out enjoying the outdoors. Every time I’ve gone up there though there’s someone pulling someone out of the ditch. Last winter even I pulled someone out of a snow drift haha. I rode with Jill, Sam and Piper (sweetest pup ever) up to Hyalite and they had a few spots picked out. We walked out onto the reservoir and man did we hit that golden light just right. Thankfully it wasn’t too terribly cold, but even if it was these two would’ve had high energy. Sam kept giving me great quotes of his, along with singing songs and goofing off. Love how much fun these two have together. We headed further up the valley for more photos after the sun went down. 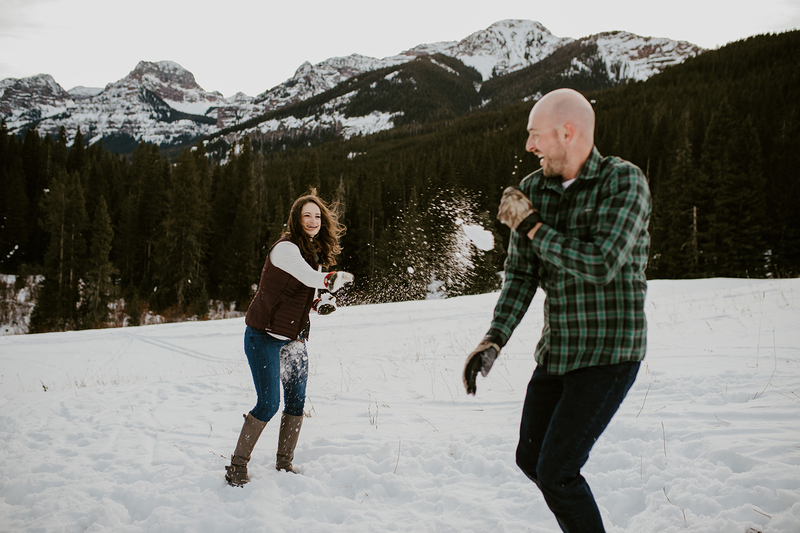 Piper sported a cozy sweater and Jill and Sam wrestled and threw snowballs at each other. These guys were down for all the cold hands and wet butts from sitting in the snow. And the didn’t even play nice, with throwing snow at point blank and tackling each other. I cannot wait for their wedding this spring at Chico Hot Springs! When we will get even more amazing mountain views and laughter.